Ted has been working with Ross Francis of Scouts Canada on the guest list. Official invitations will be sent to the Governor General, Premier on Ontario, local MP and MPP, Niagara Regional Chair, Lord Mayor of Niagara-on-the-Lake, Chair and Vice-Chair of the Niagara Parks Commission, and the Parks Canada CEO. Members of the committee will complete registration with Scouts Canada. Dave Fredericks has agreed to lend green shirts for the honour guard. The Niagara Historical Society Museum is now assembling the display which includes artifacts from the Jamboree. The committee discussed what to do if the Saturday is very rainy. Fort George may have a marquee which can be used for the ceremony. If weather if severe, it may be possible to arrange to use the Shaw Festival's large rehearsal hall. Attendance for the Scout Brigade appears to be up. There are 1200 to 1500 expected. 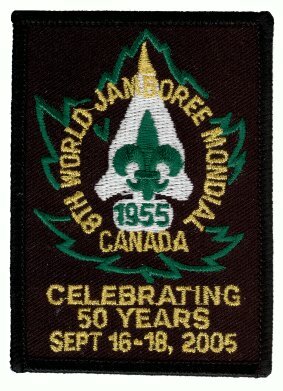 Many people are ordering WJ'55 commemorative crests through the Scout Brigade. Camping for commemoration participants is possible, but there are no grey water facilities. Participants could buy into the existing meal plan. The ceremony will need to be no longer than half an hour in order to keep the Scouts' interest. At the end, the Scout Brigade will do a march past on their way out. Committee and visitors are invited to attend the Company of Good Cheer, an adult social occasional late Saturday evening. The Scout Brigade is very supportive of having a band in the parade. The committee briefly discussed who could be the keynote speaker for the celebration. Normally, a senior VIP would do this. A prominent Jamboree participant would be ideal. It may be difficult to find someone like this as there is no list of prominent Scouts or of WJ'55 participants.